On October 30, 1938, families across the country were gathered around their radios when their regular programming was interrupted by an announcer delivering news of a meteor strike in New Jersey. With increasing intensity, the announcer read bulletins describing terrifying war machines moving toward New York City. As the invading force approached, some listeners sat transfixed before their radios, while others ran to alert neighbors or call the police. Some even fled their homes in panic. But the broadcast was not breaking news-it was Orson Welles' adaptation of the H. G. Wells classic, The War of the Worlds. In Broadcast Hysteria, A. Brad Schwartz examines the history behind the infamous radio play. Did it really spawn a wave of mass hysteria? Schwartz is the first to examine the hundreds of letters sent directly to Orson Welles after the broadcast. He draws upon them, hundreds more sent to the FCC, to recapture the roiling emotions of a bygone era, and his findings challenge conventional wisdom. Relatively few listeners believed an actual attack was underway. But even so, Schwartz shows that Welle's broadcast prompted a different kind of 'mass panic' as Americans debated the bewitching power of the radio and the country's vulnerabilities in a time of crisis. Schwartz's original research gifted storytelling, and thoughtful analysis make Broadcast Hysteria a groundbreaking work of media history. 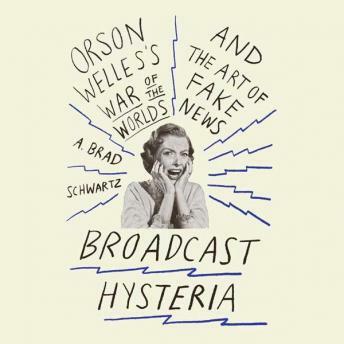 A .Brad Schwartz is the author of Broadcast Hysteria: Orson Welles's War of the Worlds and the Art of Fake News (Farrar, Straus and Giroux, 2015). The book is based on his groundbreaking research into the infamous 1938 'panic broadcast,' conducted as part of his senior thesis in history at the University of Michigan in Ann Arbor. Brad also co-wrote a 2013 episode of the PBS series American Experience about the War of the Worlds broadcast, based in part on his thesis research. Brad received his BA in History and Screen Arts & Cultures from the University of Michigan in 2012. As part of the University selective screenwriting program, he wrote Open House, a murder-mystery/comedy short film that premiered at the Traverse City Film Festival in 2013. It has since screened as official selection of NewFilmmakers Los Angeles and the 2014 Maryland International Film Festival.